Each year since 2011, VMV Hypoallergenics Philippines has donated a portion of all “pink” product purchases to the ICanServe Foundation through its campaign to “Dew” Good. 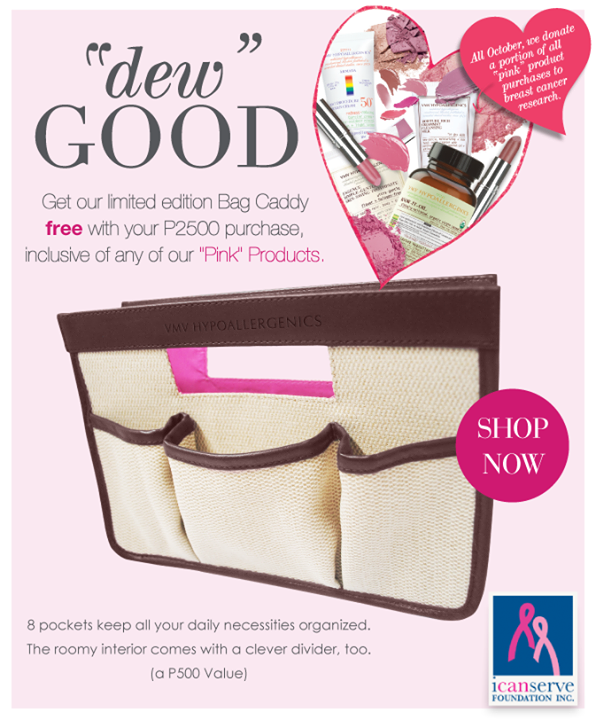 This year, customers also get a limited edition Bag Caddy FREE with every P2,500 purchase, inclusive of any pink VMV product. Step 1: Shop! Make sure to add a “Pink” product to your cart. Step 2: Add the Bag Caddy to your cart. Also available at VMV Skin-Specialist Boutiques and Counters nationwide. Undergoing chemotherapy or know someone who is? Find out what products you can use. ICanServe uses donations from collaborations, like “Dew” Good by VMV Hypoallergenics Philippines, to fund programs that provide hope and help to women with breast cancer, and those at risk.